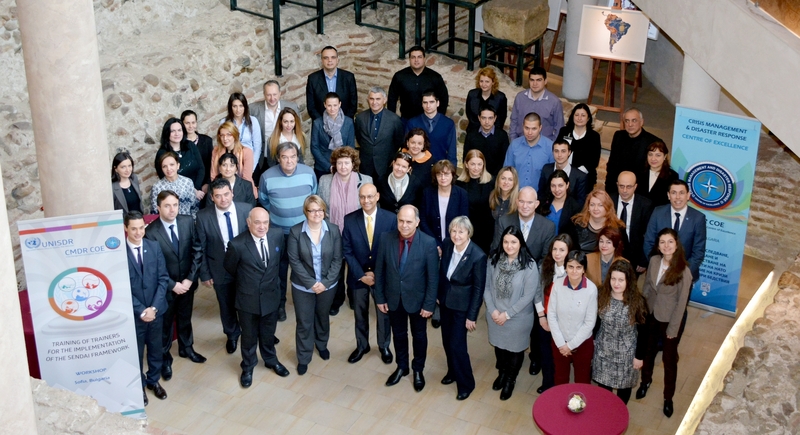 In concern of the UN Office for Risk Reduction (UNISDR) efforts to promote the latest disaster risk reduction framework adopted in 2015, a UNISDR Training of Trainers Workshop was carried out from 17 to 19 January 2017 in Sofia. The event has been supported by the Directorate General Fire Safety and Civil Protection – Bulgaria and Disaster Preparedness and Prevention Initiative for South Eastern Europe (DPPI SEE) and accommodated by CMDR COE. More than 50 experts from 10 countries (Albania, Bosna i Herzegovina, Bulgaria, Canada, Croatia, Georgia, FYROM, Montenegro, Serbia, Slovenia), representing various international organizations and national institutions, attended the training. During the 3-day workshop the attendees acknowledged the Sendai Framework and its applications to national existing plans. The UNISDR team also brought global best practices, practical examples and encouraged sharing of experiences amongst the participants. Additionally, the participants exercised globally accepted tools in drafting action plans for integrating Disaster Risk Reduction. The CMDR COE will continue its collaboration with the UNISDR and DPPI to address the importance of understanding Disaster Risk Reduction and raise awareness of the latest developments related to Climate Change Adaptation.